Graven are working with Highland Park on their new customer experience store in Kirkwall, Orkney. The store, a first for Highland Park, will aim to attract Orkney’s cruise ship visitors from across the globe offering a truly design led and interactive Whisky experience. Read more about the project below, published by Scottish Field. 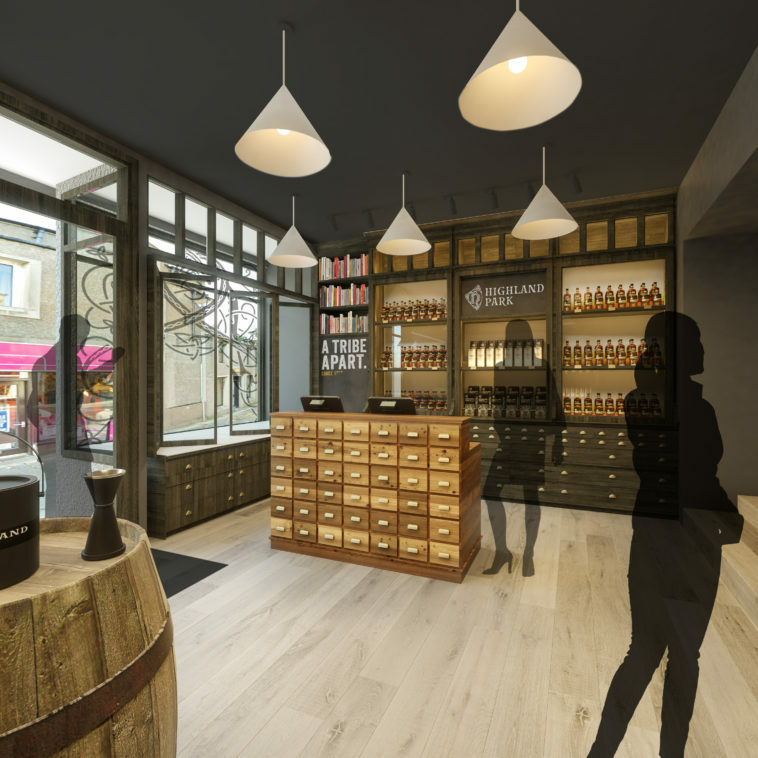 Single malt whisky brand Highland Park has invested in a customer experience store in Kirkwall, Orkney – and it’s set to open in early May. A first for the brand, the store will include a gallery featuring works from local artists and brand partnerships, a private education area for the distillery’s community training programme and a retail space offering merchandise and whiskies, including some exclusive to Orkney. Seven new members of staff have been employed ahead of the opening with an additional four members joining the team during the busy summer months. Sustainability is high on the agenda for the shop going forward. There will be no plastic bags used on the premises and a new range of consumer merchandise is in development featuring materials crafted from reusable plastics. Jason Craig, global brand director, Highland Park, said: ‘We are very excited to be opening our first customer experience store in the heart of Kirkwall. We are taking over what used to be a menswear shop called Gorns which has been in business for around a hundred years, so we are proud to be continuing a long standing business in the same premises. Our aim is to create a new attraction for visitors to the area which is an extension of our award-winning distillery visitor experience. The opening of the new Highland Park customer experience store comes hot on the heels of the Scotch Whisky Association announcing that visits to distilleries across Scotland are at an all-time high, with 1.9 million visits in 2017 from tourists from all over the world as well as from across the UK. Glasgow-based architectural firm Graven, who have previously worked on designs for Kirkwall based projects, have led the design work for the site while local building merchants Fletts has worked on the fitting of the site.